After a sell-out UK tour last year Russian-born American singer-songwriter Regina Spektor is delighted to be back in England, “her second home”, again. “I love England,” she raves as she previews her date at Sheffield City Hall on Tuesday. “This is like part four of the tour. Reginae was born in Moscow in February 1980 and began classical training on the piano there, before her family emigrated to America, and New York city, when she was nine. She continued her classical training, before starting to write her own songs as a teenager. She spent time at the Conservatory of Music at New York’s Purchase College, as well as one term studying in Tottenham, North London, where she fell in love with England. “I fell in love with it through going here and coming over to visit friends. “There’s something about England that got into my heart very early,” she says, praising the English sense of humour. “I used to laugh so much in England. But New York is very much her base, where she found fame in the mid-Noughties. She began writing pop songs in her late teens and made her recorded debut in 2001, aged just 21, with the self-released 11:11, a collection of songs influenced by jazz and blues. The 37-year-old’s commercial breakthrough came in 2006 with her fourth album Begin to Hope, which reached number 20 on the US Billboard Album Chart. The Gold-certified long player included the singles On the Radio, Better and Fidelity which climbed the Billboard Hot 100 singles chart in the USA. Her fifth album, Far, released in 2009, and sixth album, 2012’s What We Saw From the Cheap Seats, both debuted at number three on the Billboard Album Chart. She was nominated for a Grammy for best song written for visual media in 2014 for her song You’ve Got Time, which was specially written as the theme tune for hit Netflix show Orange is the New Black. The collaboration came after she was approached by Jenji Kohan, the show’s creator. Regina’s latest album, Remember Us to Life, reached number 23 on its release in the US in September last year. For now though, all thoughts are on her live shows – and how her perfect show would end with everyone having walked out. “My live shows are more about me making an experience for the soul and the mind. “My ideal experience at my show is when someone connects with a song,” she says. It could be telling someone they love them or visiting a family member they have not seen for a while, she quickly adds, clarifying the emotional connection she is talking about –and one she hopes fans in Sheffield will grasp when she takes to the stage next week. Regina plays Sheffield City Hall on Tuesday, August 1. 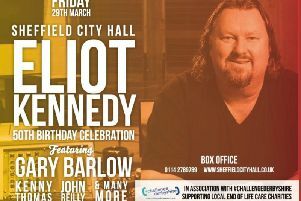 Tickets, priced from £30.80, are now available from 0114 278 9789, www.sheffieldcityhall.co.uk or in person at the venue box office on Barker’s Pool.